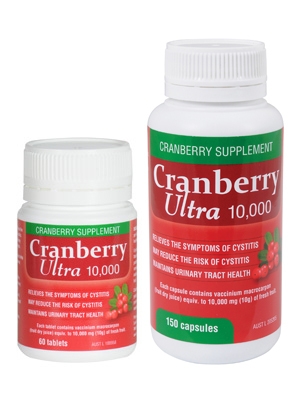 Cranberry Ultra 10,000 tablets and capsules provide relief from the pain and burning sensations of cystitis. Cystitis is an infection of the urinary tract common in women of all ages. This high potency supplement helps in reducing the risk and frequency of cystitis. It may also help to discourage the adherence of bacteria to the urinary tract and mask urinary odours associated with incontinence and cystitis. Each tablet or capsule contains vaccinium macrocarpon conc. equiv. to 10,000 mg (10g) of fresh fruit. Adult Dosage: Take 1 or 2 tablets or capsules per day with meals or as directed by your healthcare professional. Contains no added sugar, salt, lactose, yeast, gluten, dairy products, artificial preservatives, flavours, colours, or sweetners. Store below 30°C. Cranberry Ultra is made in Australia and is available in bottles of 60 tablets, 90 capsules and 150 capsules.